Stuffed olives are an olive product made from almonds, onions, and pimento. 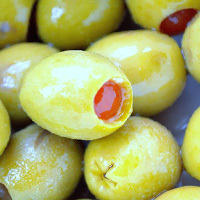 Traditionally, stuffed olives are made with Spanish green olives. The red stuffing found in it is cherry peppers. It can be used to make vodka martinis. Stuffed olive contains vitamin E.
The calories in Stuffed Olives per 3g(1item) is 4 calories. Stuffed Olives is calculated to be 137Cal per 100 grams making 80Cal equivalent to 58.39g with 0.43g of mostly fat、0.13g of carbohydrates、0.02g of protein in 3g while being rich in vitamins and minerals such as Vitamin E Alpha Tocopherol and Sodium.